Marriott has expanded its portfolio of hotels in the vibrant city of Hong Kong with the opening of the 471-room Ocean Park Marriott Hotel. 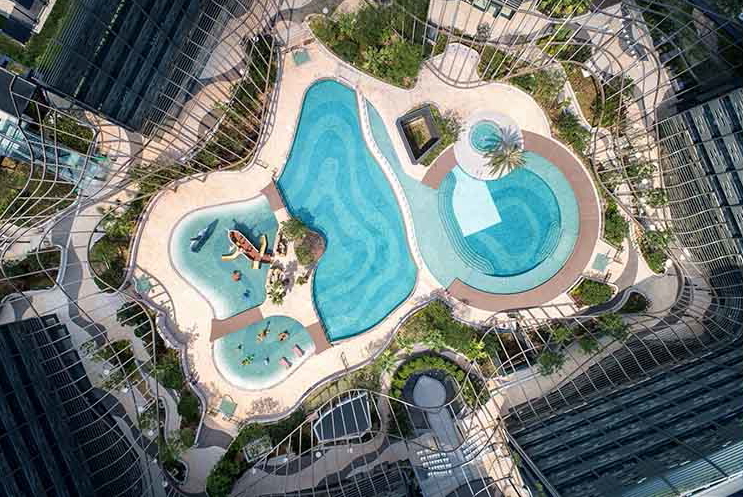 Designed by Aedas, Hong Kong Ocean Park Marriott Hotel is an homage to a modern urban green oasis comprising of three towers – The Pier Wing, Club Wing and Marina Wing. It offers 471 smoke-free, contemporary rooms and suites, including three types of Ocean Park-themed rooms in The Pier Wing and Marina Wing. The Hong Kong Ocean Park Marriott Hotel has commendable green credentials and features a façade that has energy-saving components to keep the building cooler in summer, rainwater collection areas, and vertical planting systems can be found throughout the hotel. With families and staycations in mind, at the heart of the destination resort is the large lagoon pool which includes children’s pools. The hotel also has four F&B outlets, a large amount of meeting facilities - including an 1,200sqm pillar-free ballroom, Hong Kong’s first Harnn Heritage Spa and a fitness center. All dining outlets also serve WWF-certified sustainable seafood from approved suppliers. Hotel guests are also entitled to exclusive Ocean Park benefits, such as special opening and seasonal offers, when staying at the Hotel. See latest HD Video Interviews, Podcasts and other news regarding: Marriott, Hong Kong.